Do what you love. It’s a mantra that our owner, Francis Ford Coppola, has lived by and repeated often. He has built his life following his interests and inspiring others to do the same. For our In Pursuit of Passion interview series, we’ll chat with someone who is out there living boldly, pursuing passion against all odds, and reaping the rewards. Much like how Francis achieved success in film and wine, sometimes taking the biggest leaps of faith and being true to yourself will produce the finest results. In person, Anne is as warm and appealing as the luxe, sumptuous oversized throws she’s taught thousands to knit with their own two arms. With the runaway success of her blog and book, you’d think she had a well-planned lifelong plan to dominate the field of fiber makers. Which makes her twisting, turning, and utterly inspiring story all the more enchanting. For Anne, pursuing a passion was the magic trick that finally unlocked the true meaning of her life. 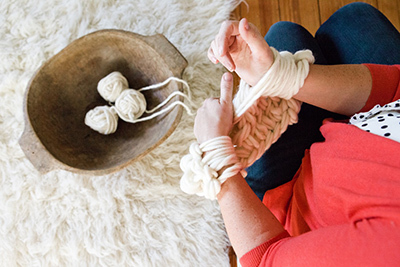 Q: You’ve got a gorgeous blog, Flax & Twine, and a best-selling book, Knitting Without Needles. Tell me where you got started and what led you to where you are now. A: I had a very different career before I started Flax & Twine. Honestly, I did not spend enough time when I was young figuring out what I loved. When I was a child, I loved to make things. I made things all the time. I made gifts for everyone, I knit, I crocheted, I embroidered - you name it, I did it. I just wanted to make things for people that had meaning and were beautiful. But I grew up in a household of very high achievers - do the most, be the best - that sort of thing. Q: So, rather than pursing a more creative career, what did you do? A: I went to Yale and then moved to New York City to work on Wall Street for an investment bank. I have both left brain and right brain, and I excelled in that job, but it really lacked the creativity that I loved. I was in this high-powered job and was very dissatisfied. I felt like I really needed to make a change, so I moved to Boulder with my husband and started trying to figure it out. But the job kept following me. The bank I’d been working for kept calling and it was so hard to extract myself from that because it was good money, it was easy, and it was convenient. Q: At that point, were you taking time off to sort out your career while your husband worked full time? A: Well, that was the intention, but we moved to Boulder, we had the three kids in short order and I was doing small jobs here and there for the bank, and my husband came home one day and told me, “I quit my job today.” I was shocked. He said that he really wanted to pursue his passion for sports analytics. Before that, he was working for a financial services company. He’d also been on Wall Street when we were living in New York, and I was totally unaware of this dream of his, but of course, I told him yes, I would support him while he pursued his dream. Q: So you moved to Boulder to pursue your passion…but then ended up supporting your husband while he pursued his first? A: Pretty much. I started doing real estate investment and analysis for an investment firm and ramped up to 40-60 hour a week - with the three kids. After two and a half years, I was done. I was finished with the job that I didn’t love and though my kids brought a ton of joy into my life, I didn’t have the personal fulfillment that I was looking for in my professional life. I told my husband he needed to get a regular job. And to his credit, he did, and continued to work on the sports analytics thing at night. Once he had a more stable job, I started weaning off my hours with the firm. Q: Once you had some time for self-reflection, did you have a direction right away, or were you still feeling things out? A: At that point, I was trying to figure out what I was going to do. A friend told me to start writing a blog. My original blog was about finding my creative voice, so I’d be making things with the kids and sharing them on the blog and I got that blogging bug. 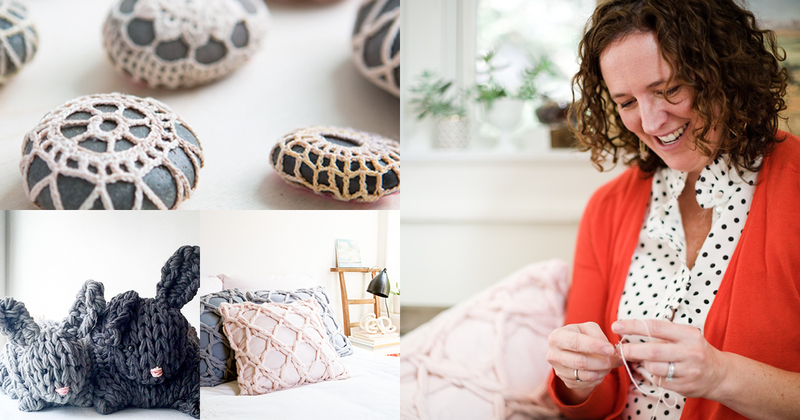 I was looking at all of these other blogs and kept thinking, “I could submit my work for that.” And then Gabrielle Blair, of Design Mom, shared one of my projects on her site. I was over the moon. Next, I submitted a project to design * sponge and they published it. I just felt incredible. I loved writing the tutorials and I love making things, but what I found is that I love photographing them even more. I love that there’s this idea, that there’s this beauty going out into the world. Q: Your projects are beautiful, as is the photography and styling in your images. Why is that important to you? A: Beauty is something that just fills me up. It makes my heart sing and it makes me feel good. I believe it does that for other people, too. It feels frivolous sometimes, especially when heavy things are going on in the world, but it’s just such pure joy that I can’t see something being wrong with that. Q: The blog was starting to take off at that point and you’re enjoying it, but what happened next? A: I was starting to make money from the blog, while still making money from my firm, but reducing my hours. Meanwhile, after a year in his job, my husband was working for the San Antonio Spurs - for free. Which was good, because it was a job, but three weeks after he started, he got a call from the Baltimore Ravens. He flew out and when he came home, he was like, “I’m leaving in a week to be the head of analytics for the Baltimore Ravens.” It was crazy - I never anticipated that happening, but he always said that it would not have been possible without me. He was able to fulfill his ultimate dream because I supported him - which he always gives me credit for whenever he talks about it, which is so sweet. Q: It sounds like he wholeheartedly understands how critical your sacrifice was to his success. A: He does. And that was the point where he told me it was my turn, and that I needed to stop doing all the real estate stuff, I needed to quit, and I needed to pursue MY dream. So that’s what I did. Q: So, you moved to Baltimore and it’s your turn. What was the next curve on the path? A: I finally stopped taking on new work from the firm. Over the next year, as projects were sold, I worked less and less at the firm and more and more on my dream. The day I sold my last project, I got a book offer. I think the universe is weird that way - sometimes, you really have to close doors to allow others to open up. Q: How did the book offer come about - was that something you’d set your sights on or was that unexpected? 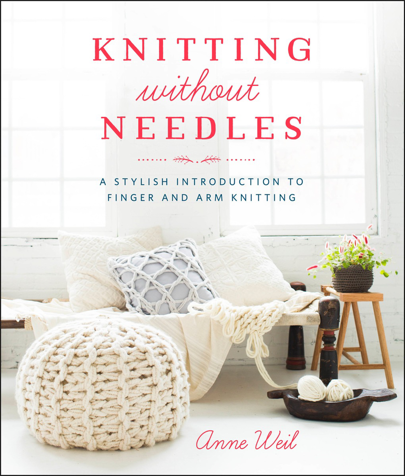 A: I had been developing a book idea around the finger-knitting concept. But the offer made me feel like, OK, it’s time. I found an agent and they went out to eight different publishers and three of them were interested, so they competed for it, which was super exciting. And that’s how Knitting Without Needles was born. I picked the publisher who would allow me to create a book that was beautiful and modern - not a kids craft book. I fell in love with writing the book and I did all of the art direction, so it was like decorating an entire house, a work of art in itself, pulling it all together, and I really loved that. Q: Your day to day routine now must be a sharp contrast to your days on Wall Street. What is it you love most about your new daily norm? A: Just the fact that my every day is about making things. Two things: I love working with my hands, and I love coming up with ideas. I think of all the things I can make and new project ideas and I just get so excited. Q: How do you develop the new techniques? A common assumption is that knitting techniques are fixed. But you continue to develop new techniques all the time - how does that work? A: It’s so important to me and it’s such a huge part of making things that I love. When I started arm knitting, I loved the way that it wasn’t just about making a cowl, it was about forming these enormous stitches. That led me to start thinking about all of the other things you could make if you applied all traditional knitting principals to arm knitting. After that, it was just about me playing with it to see how it works best, how I should hold my hands, how can I teach someone else how to do this, and then I develop it from there. Q: Do you think that having an analytical side has allowed you to look at knitting in a different perspective? A: It’s interesting, because I’m not a geeky knitter who’s into super intricate designs. My work is clean and simple. I use my analytical side for running the business, but my actual work is more intuitive. I’m sure I could do things faster if I used more math, but for me, it’s about looking at things and tweaking the process to get the result I want. Q: Those simple designs are so appealing to those who’ve never knitted. Is that a large proportion of your audience? 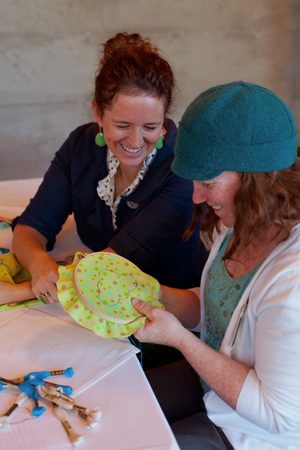 A: I’m not in a traditional knitter’s niche - I teach a ton of people who have never knit before. I love that. The delight in their eyes when they make this giant, gorgeous thing in under two hours using just their arms - they’re so excited, which makes me so happy. It’s so cool. Q: It sounds like with every step of your career, you’ve taken a step down a road to pursue a passion and then it’s led you to unexpected places. Do you have any inkling of what’s coming up next? A: I’m working on my next book, which is about weaving. It’s not going to be a tapestry weaving book - more about what’s possible when you innovate on weaving techniques. Not so much floor looms or even fancy table looms, it’s all based on weaving without looms, or using lap looms or made loom projects. I want to bring weaving to the masses. Like, you can do it and you can do it and you can do it, let me show you how. Q: What do you think caused the explosion of big knitting and textiles? Why is it so appealing, suddenly, to be knitting? A: I think part of it is that it’s new and different - the scale is so crazy and people haven’t seen that before. You imagine all of the things you can do with it at that scale. Just look at the work of Jacqui Fink of Little Dandelion - incredible wall hangings. But I also think that people crave coziness in their lives and that’s a draw of fiber. It’s soft, comforting and reassuring. And with the big knitting, you can dive into it and it can encompass and envelop you, which I think is appealing. Q: Are you moving on to weaving because you think we’re at the end of the big knitting phenomena, or are you just ready for a new challenge? A: You know, I hesitated to move on to this next thing and leave the big knitting trend behind, but that’s just the person I am. I’m always ready to move on to the next thing and move on to the next horizon. And I still love huge knitting, I always will. Q: What would you tell anyone who has a passion, but is hesitant to stray from a more traditional path? A: I encourage everyone to follow their instincts. For me, I watch really carefully the things my kids are into. For example, right now, my daughter is really into fashion. That doesn’t mean she’s going to be a fashion designer, but she clearly has an interest and I want to encourage that. It took me a long time to get over the idea that being an artist or being a maker isn’t less than. To me now, it’s more than. I feel like this is my meaning and purpose in life, and it’s my passion. It really is what I love to do. And that’s really what we’re all looking for in this world anyway. While I don’t regret the path I went down, because it allowed both my husband and I to pursue our dreams - I do wonder what the path might have been if I had followed those interests sooner. I’m just so glad I found them when I did and had the courage to explore them. Q: How do you relax at the end of the day? A: I love sharing a cocktail with Sandy (her husband) to unwind from a busy day of making. Especially if we can enjoy it outside - the porch, the park, etc. There's always a reason to celebrate being together. And I love bubbles - I'm obsessed with the idea of Sofia Mini. Bubbly to go, it's brilliant.